I have stayed in a lot of hotels. Indeed, you know you have stayed in an awful lot of hotels when you are able to run a tally of the hotels that you've stayed at in the particular city you happen to just have arrived in. So, as I checked into another hotel last weekend in Paris it got me thinking: I really need to put this wealth of accommodation experience I have to work. So, why not start with Paris. Here are four hotels that I have stayed at in Paris. They range in price and location, so I hope there is something for everyone. All four are great and will leave you with a spring in your step for the committed shopper and fashionista to focus on what you need to in the City of Lights. A beautiful hotel. 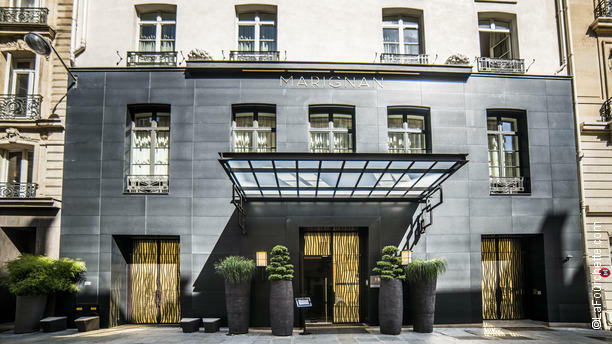 This place is in a grand spot on Rue du Faubourg Saint-Honoré and is a hotel fit for the magnificent location. The hotel has been there since 1925 and is pure luxury. My better half arranged our first stay here, when he was in the 'wooing' phase. On that occasion he dazzled me with an array of romantic walks; sightseeing; picnic lunches and swanky dinners. Ah, the stuff dreams are made off. How things have changed. Our Paris trips are now dominated by a lengthy shopping list (authored by, moi) together with plenty of posh dinners; but there's always plenty of room for romance in Paris. Throughout its long history, Le Bristol has seen and still sees movie stars and celebrities grace its elegant rooms and restaurants which means it really is a place to spot celebs when you stay. There are many things I love about this place: the indoor pool - still in 1920s style, the exquisite Louis XV and Louis XVI-period decorated and furnished rooms, and a bar serving immac cocktails. But if I had to choose the one thing that puts this place above all else, it would be the location. The location is second to none. A 5 minute walk from Champs-Élysées and slap in the middle of a fashion and shopping utopia. Most of the greatest fashion houses in the world are either represented or headquartered within a few hundred metres of the hotel. I can't leave Le Bristol without saying something about the restaurants. Now, as you know I don't eat a whole lot, but the restaurants and food at Le Bristol are exceptional. Breakfast at Cafe Antonia, where they actually individually stuff raspberries with blueberries and then nestle them in your granola, is a sight and experience to behold. 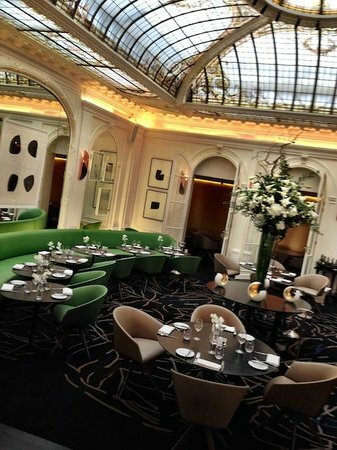 We have dined at the Michelin star 114 Faubourg a few times and it is very, very good. I can only imagine that the flagship restaurant, the 3 Michelin star: Epicure, must be truly epic. We have never yet managed to get a reservation; whether or not we've been staying at the hotel. Le Bristol is outstanding. There are not really enough superlatives to describe how lovely it really is. And it has a price to match. If you have a special occasion, go to Paris and experience true movie star elegance in a totally classic, timeless environment. You won't be disappointed. This little 5 star beauty is a hidden gem. It is located between Avenue Montaigne (shopping and fashion heaven), Champs-Elysées (every high street shop you'll ever need) and Avenue George V (swank), which I love. Locations don't get a whole lot better than that. The rooms are Parisian compact but very nice; very light and airy which is far from common in Paris, even in nice hotels, so this is a real plus. And, if you get a higher floor there's a fairly good chance that you will have a view; which if you are very lucky - or if you pay for a room with a view - might even give you a peep of the Eiffel Tower. Although my room didn't have one, some of the rooms I could see out of my window had little balconies which looked lovely. The atmosphere is smart and refined - the public spaces and rooms are appointed with designer-y looking furniture so it all looks and feels nice and slick. I also found the staff very friendly in a city which is not exactly renowned for that particular feature. The hotel has a nice little bar (the Simone Vielle bar) just as you walk in the door, which is a great place for an aperitif after a day of browsing, buying and sightseeing. Matt stays at this place when he's in Paris for business, so he also thinks it does the trick. While the prices are not cheap, for 5 star luxury in an excellent location they are surprisingly reasonable. This place is always on the list when we choose were to stay in Paris. Moving to the Left Bank, and on the edge of St Germain, this is another part of Paris that I just love. This is not a super-high end hotel but has cute little (yes, Paris little so no room for 7 cases) rooms and at great price. The place is decorated throughout, rooms included, with Renaissance frescos and paintings which give it both uniqueness and charm. No, it does not have all the gizmos of a 5 star property but the rooms are cool and it is a 2 minute walk from the beautiful sights of the Seine and Notre Dame and a 10 minute walk from ground zero Saint-Germain-des-Prés, the home to some amazing shopping as well as my favourite Parisian cafe, the legendary Café de Flore. So, if want somewhere well located with interesting rooms and to reserve some of your euro budget for YSL and LV, try this excellent little place. Last and by no means least is the Hôtel Vernet. We stayed here last weekend for the first time. What a great hotel. Located very close to the Arc, right behind the Publicis Drugstore (which, at the Brasserie (the store contains three restaurants), incidentally does an excellent Saturday brunch - champagne included - which you have to try), it is super central. Very elegant, with lovely spacious rooms - and let me tell you, a spacious room in Paris is not a common thing. After checking in and passing through the lobby, you are taken to your room in a old-style open lift which adds to the sense of drama. The restaurant is covered by a beautiful stained glass dome which is just a lovely place to enjoy breakfast. We loved the Vernet and this is a place that we will be going back to. That is my four-pennies worth. Paris has literally thousands of hotels. There are many others that will be better, and many more that will be worse than these four. But these are four that I know, and on each case loved, leaving me with the fondest of memories in a city that I love.